The pea is a green, pod-shaped vegetable, widely grown as a cool-season vegetable crop. Peas are little powerhouse of health packed with lots of nutrients and antioxidants. The glycemic index of peas is 48 which is low. It is considered as a boon to inculcate green peas in your daily diet to naturally include vitamins and minerals. Being very low in calories it is also contributing in preventing obesity and other such lifestyle diseases. Is Green peas safe for Diabetics? Since the glycemic load of green peas is only 5.3. It proves to be really beneficial for diabetics. Obviously portion size is important. Green peas contain very low amount of complex carbohydrates (11.1) in ½ cup (approx. 70 grams). Plus green peas also has good amount of soluble fiber (6.02 grams in ½ cup) which further helps in slow absorption of the nutrients and ultimately your blood sugar levels will not fluctuate and go haywire. As green peas also contain 5.04 grams of protein in just ½ cup, it really gives a feeling of fullness when combined with any cereal/pulse. It is always advisable to combine your vegetables with other food groups which is low in glycemic index, so that the glycemic load of the overall meal is low. Choose wisely and make accurate choices. Is Green peas suitable for Weight Loss? Being very low in calories (65 calories in ½ cup), green peas is the most commonly used guilt free ingredient in daily diet. They taste delicious as well as is also very nutritious at the same time for the people focusing on losing weight. It is a versatile vegetable which goes with every other recipe and contributes in making it a wholesome recipe. 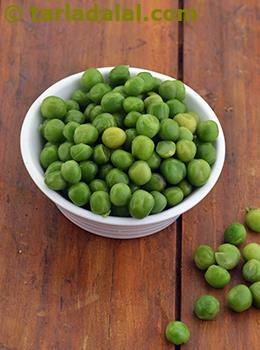 It also has 6.02 grams of fiber in just ½ cup which makes green peas the best option to select. Eating fiber rich foods leads to slow absorption of nutrients in the bloodstream which eventually makes you full for longer period of time and thus avoiding binge eating. Consumption of excess calories is also reduced to a large extent. Hence aids in weight loss.